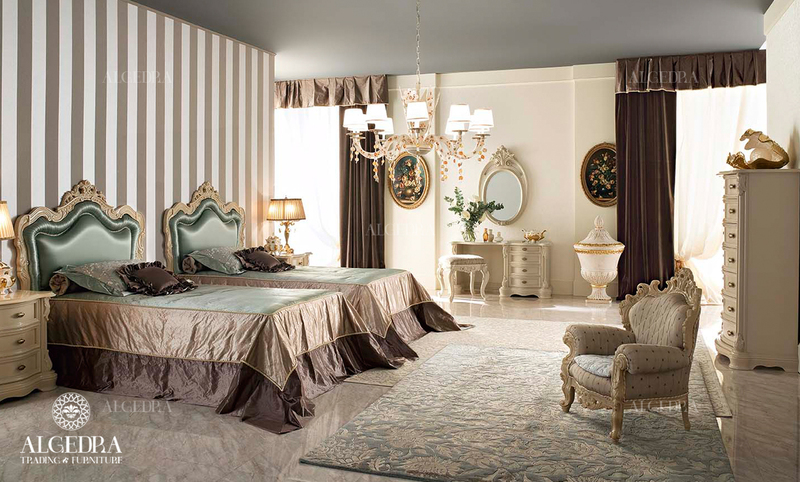 The bedroom is the most versatile and important room in the house, not only to take a break, relax and sleep, but you can also store clothes to pick from them every day, therefore with these multiple uses of the bedroom comes the need to select a variety of furnishings and favorite accessories, in the following "ALGEDRA" experts explain the most important pieces of furniture and the things that must be contained in the bedroom. Bed which is undoubtedly the most important piece of the room furniture, you can select double or single bed as needed, you may choose either wooden or brazen, but more importantly for the mattress to be comfortable, for example, you can select feather mattresses and put a blanket of fine wool, which gives a sense of warmth‏ with some comfortable feather pillows to get better sleep. Safes have several types, including wall safes which despite their large size, help to contain a large number of things, it also helps to save space in the room, for example, you can put a small closet next to the bed for keeping books you read before going to sleep. You can also make an appropriate box with a bed the size at the bottom of the bed which can be used for both storage and sitting. If the space in the bedroom allows the exploitation of one of the corners its's possible to put two chairs with a small round table to create a cozy conversation area. Accessories depend on the taste and preferences of the house lady and helping her choose the best accessories is the specialty of "ALGEDRA" and its team, for example we can hang a personal painting over the bed, we could also use carpets which add elegancy the room and gives some warmth, we can also add a wall mirror, for added luxury a flat screen can be added against the bed in order to relax and enjoy watching your favorite programs on weekends.